Explore Downtown San Francisco, the world famous Golden Gate Bridge, Golden Gate Park with unlimited hop-on hop-off use for 24 hours. This 1 Day Hop-On Hop-Off pass combines three sightseeing tours on one incredible value ticket! 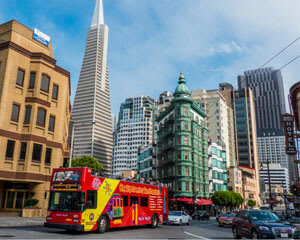 It gives you the opportunity to explore Downtown San Francisco, the world famous Golden Gate Bridge, Golden Gate Park with unlimited hop-on hop-off use for 24 hours. You can hop on and off the bus at any of the designated stops to explore all the major sights of San Francisco at your own pace.